During World War II 166 USAAF aircraft and crews opted to fly to Switzerland. Forty-one were totally destroyed in crashes, thirty-nine were badly damaged and eighty-six were repairable. Of the 166 interned USAAF aircraft 76 were B-17s: 65 - 8th AF; 2 - 12th AF; 9 - 15th AF. 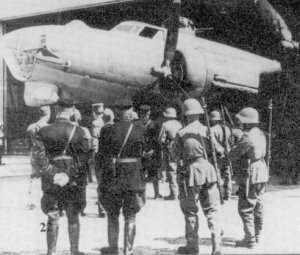 Three 303rd BG(H) B-17s and crews were interned. Hit by fighters after passing Strasbourg. One engine was knocked out and feathered. Lt. McClure dropped out of formation, bombs were jettisoned and the B-17 turned towards Switzerland. They were soon hit by another German fighter. The No. 3 engine was set on fire causing the propeller to windmill, the chin turret became inoperative. A hit in the waist area seriously injured one of the Waist Gunners. A cannon shell hit just behind Tail Gunner Sgt George A. Senheiser causing further damage. The B-17 crossed the Swiss border near Basel and Lt McClure landed his B-17 on a hard surface runway at Geneva. The wounded Waist Gunner was taken to a hospital in Geneva. 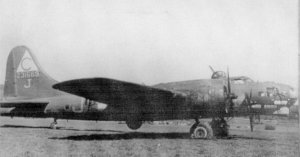 The B-17 remained in a Geneva-Cointrin airfield hangar at Geneva until it was flown by Oberst Hogger and Wachtmeister Schraner to Dubendorf on 13 July 1945. It was later scrapped. Lost one engine in a fighter attack before reaching the target at Oberpfaffenhofen, Germany Nearing the target, flak damaged another engine, it's propeller ran away and could not be feathered. Realizing that they were badly damaged, low on gasoline and could not make it back to England, the crew elected to head for Switzerland. Shoo Shoo Baby landed at the Zurich airport with twelve flak holes in their B-17. All classified equipment was destroyed before landing, including the bombsight, IFF & CHF equipment, flimsies and maps. [E&E] - 2Lt Elmer P. Israelson (Bomb) escaped from Switzerland, evaded capture (E&E #2734) and returned to England on 2 December 1944. 2Lt Robert W. Snyder (CP) was a substitute crewman. See: 358th Snyder Crew. 1Lt Samuel Minkowitz (N) was a regular member of the 358 BS Lt Walter W. Troppman Crew Sgt John W. Bahr (LWG) substitute crewman who had flown seven previous missions with the Lt Raymond Hofmann Crew. S/Sgt Thomas S. Hickey (TG) was a substitute crewman who had flown 15 missions with several other Pilots. Escaped from Switzerland with the help of the Maqui (French Underground). Smuggled out in a coffin posing as a dead man. Died in Alaska in 1955. Just after "Bombs Away" the aircraft was hit by flak which tore a hole in the wing between the Number one and two engines. It then came back almost into its formation position, stayed there momentarily, and then went off to the right under control and holding altitude. The Fortress was spotted heading for Switzerland with fuel leaking from the wing. While flying to Switzerland, two P-51 fighters appeared and escorted them to the Swiss border. Swiss Air Force ME-109s then guided them to an airfield. 1Lt Paul H. Long (P) and 2Lt Harold L. Carlman, Jr. (CP) made a difficult landing at Dubendorf, Switzerland. The No 2 engine had been shut down with the damaged number one engine operating erratically. Flak damage to the flaps made them inoperative and resulted in a high speed final approach and landing. 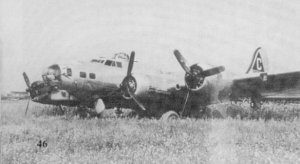 The B-17 overran the runway and came to a halt in a meadow. Swiss engineers who examined the B-17 counted sixty hits from flak shrapnel in the left wing in addition to two large holes. Daylight could be seen through the large wing holes. The crew was released from internment in April 1945. 2Lt Harold L. Carlman (CP) was a regular member of the Lt Avery L. Atwell Crew. 2Lt Charles E. Cassidy (Bomb) was a regular member of the 360th BS Lt Hector F. Vitale Crew on his 12th mission - his first and only mission with Lt Paul H. Long. For the Internment story of T/Sgt Arthur L. Habich, see Hell's Angels Newsletter, February 2001, "What was it like to be interned in Switzerland?"